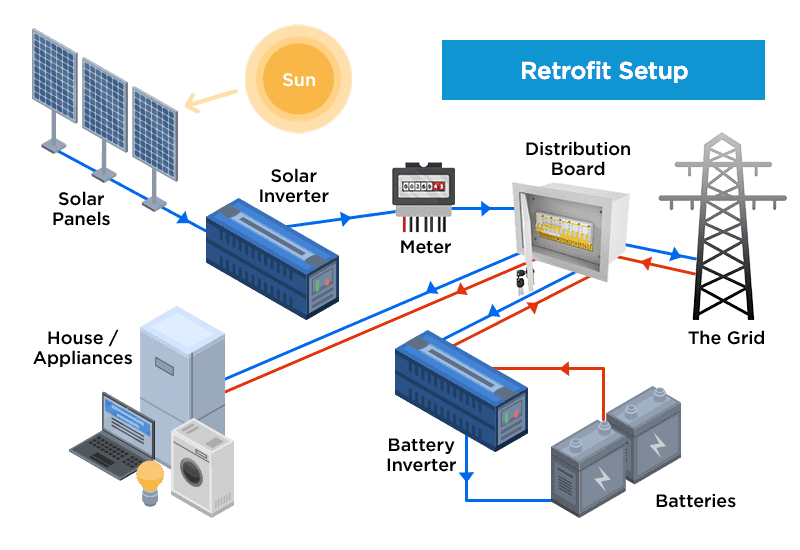 If you have a solar system and want to add battery storage (and do not have a hybrid inverter) you can retrofit a battery to your current system. To retrofit a battery to an existing solar system requires adding a battery inverter, a metering unit and the battery to your system. A battery inverter is different from a solar inverter which your system will already have. A solar inverter will only convert DC power from the panels into AC power for your home. Battery inverters can convert DC power into AC and vice versa, which allows the battery to be charged from the solar system and discharged to power your home when the sun is not out. 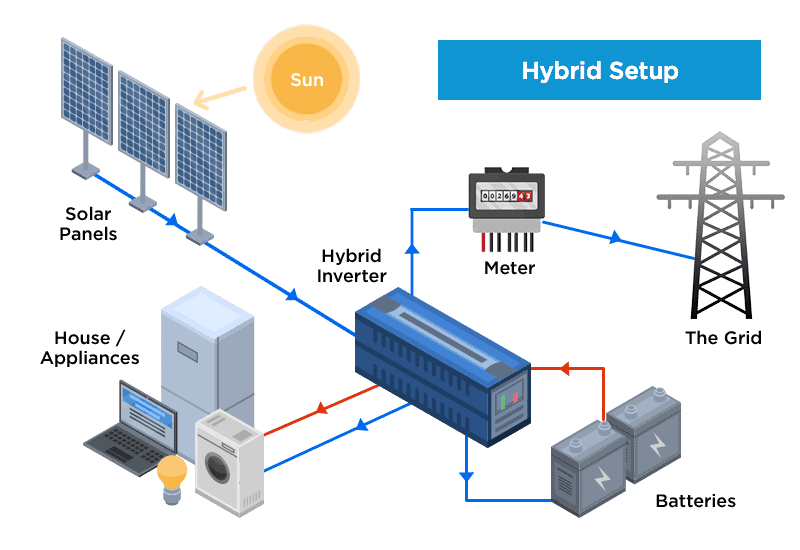 If you opted for a hybrid or battery ready solar system when installing solar this means your system has all the additional components installed and is ready for you to add batteries whenever you’re ready. A hybrid or battery ready system will have a hybrid inverter which is an all-in-one inverter (solar and battery). An Off Grid Solar System is also called a ‘stand-alone’ system. This system is not connected to the grid and requires a battery system. Off Grid Solar PV Systems are rare and usually only found in rural areas that have difficulties connecting to the grid. These systems must be designed to be able to support enough energy and storage to meet the needs of the home or property day and night with no assistance from the grid. A backup generator can be put in place in case the Solar PV System is not generating enough electricity due to weather conditions at certain times of the year. Important note: If your purpose for adding battery is to go completely Off-Grid it will come at a price. 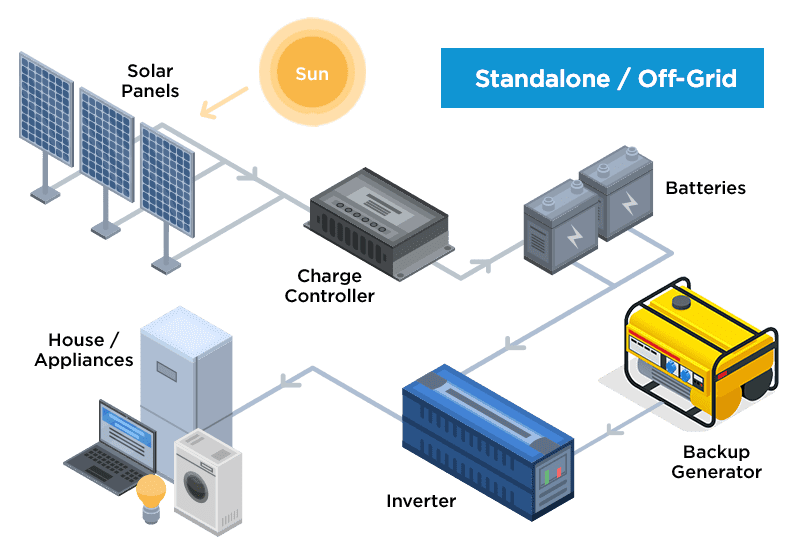 Off-grid solar systems with battery backup start at approximately $30,000 due to the solar and battery system needing to be large enough to have no reliance on the grid. For homes in metro areas going Off-grid is not cost effective and is only recommended for those in remote areas with limited access to the grid. Speak to installers about which solar and battery system will be best suited to you. Receive 3 Obligation Free Quotes!